Mercedes-Benz, the "Official Vehicle of the US Open" and "Presenting Sponsor of the US Open Men's Singles Championship," has teamed up with thirty Tri-State Mercedes-Benz dealers to kick off a Tweet Rally to the 2011 US Open. What is a Tweet Rally? We're glad you asked.. The luxury auto brand will tweet out clues to secret locations throughout the region. At each correct location, a special tennis themed 2012 ML 350 SUV will be parked awaiting the successful scavenger with VIP tickets to the U.S. Open. 90 pairs of tickets will be given away during the two weeks of the Open, including one pair that will be given away personally by Mercedes-Benz spokesman, Roger Federer. Mercedes-Benz is in the second year of its sponsorship, which runs through the 2014 U.S. Open. The brand will again place its vehicles throughout the USTA Billie Jean King National Tennis Center, receive promotional exposure throughout the event, exercise national TV media commitments, and receive an extensive presence on USOpen.org. 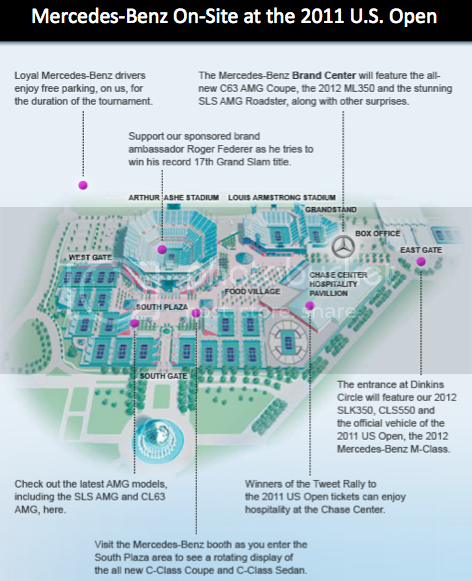 Mercedes-Benz is also an official sponsor of Arthur Ashe Kids' Day preceding the tournament. Check out the map below to see how they'll activate throughout the grounds.